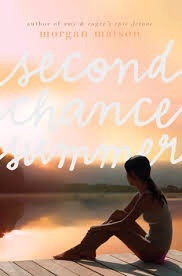 Every so often something comes along that really tugs at my heart, and Morgan Matson’s Second Chance Summer is one of those novels. Categorized as young adult fiction – perhaps because the protagonist is a teenager – the novel follows Taylor alternating narratives between the present day and events that happened five years in the past. What would you do if a loved one was dying and you could do nothing to stop it? Would you run away from it, or would you have the strength to face it head-on? In Second Chance Summer, we see a family that appears normal on the surface, but underneath is struggling just to make it through each day. On Taylor’s birthday, her parents sit her and her siblings down, and inform them that their father has just been diagnosed with stage IV pancreatic cancer, with only four months left to live. The family decides to go back to their summer lake house in the Poconos – which they’ve rented out for the past five summers – to have one last summer together and bond as a family while they still can; something that none of them are used to doing, as they are all closed off and rarely speak about their emotions with one another. Taylor, in particular, has a habit of running away from things that frighten her, love, friendship, anything emotional. Five years ago, she ran away from the lake house and the two people that she was closest to in the world. Will Taylor be able to face her past and her father’s rapidly deteriorating health, or will she do the one thing that is most natural to her? Will she run away? Second Chance Summer is about many things, but I think the most prominent theme is time and how it runs out. Without warning. You can’t run away from time any more than you can run away from pain or heartache or the possibility of falling in love. Time doesn’t wait until you’re ready, it keeps moving, ticking away the hours. In one way or another, we are all guilty of running away from something or someone, but, like Taylor realizes in the novel, there are some things that, no matter what you do, you just cannot run away from. You have to stand still. And, by choosing to face it, you will become stronger.